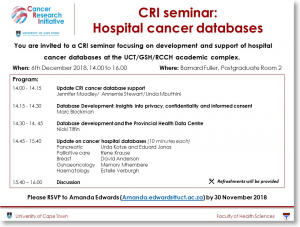 You are invited to a CRI seminar focusing on development and support of hospital cancer databases at the UCT/GSH/RCCH academic complex. The event will take place at the Barnard Fuller (Postgraduate Room 2) on 6th December 2018 from 14.00 to 16.00. 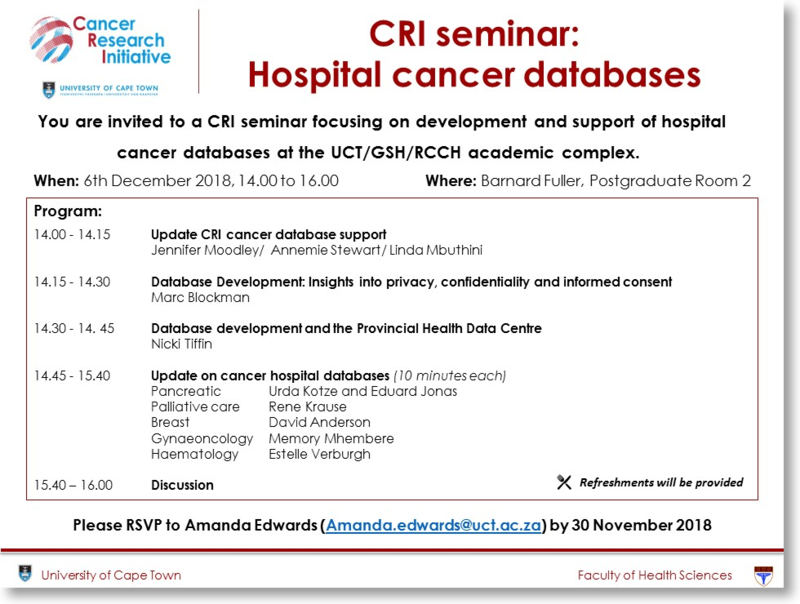 We would like you to diarize the Cancer Research Symposium that is being organized by UCT’s Faculty of Health Sciences. The event will take place on 17th February 2018. Kindly note that more information about the symposium will be availed in the coming weeks. The Health Sciences Library has announced the start of the research lecture series from September – November 2015. Sign up for ORCID and Google Citations; track your citations and how to find where to publish. Harris Onywera on Are You the Ironman or Wonder Woman of the Science?